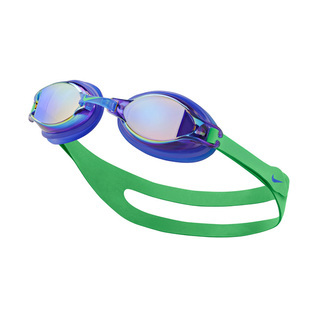 Do not be blinded by the light in outdoor swimming environments with the all new Nike Chrome Mirror Swim Goggles. Mirrored coating like no other goggles out there it will be like you are swimming in doors with indoor lights, the sun stands no chance. Love the lenses on these goggles! The lenses are great, but one strap kept slipping through the clip on one side. I've only worn them once so far and am hoping it's a not a permanent "thing", otherwise I will stick with my Nike "Vanquishers"